It's the first Thursday of the month, which means I venture from running topics, and talk about blogging topics instead. Today, I want to focus on How to Run an Effective Blog Giveaway. 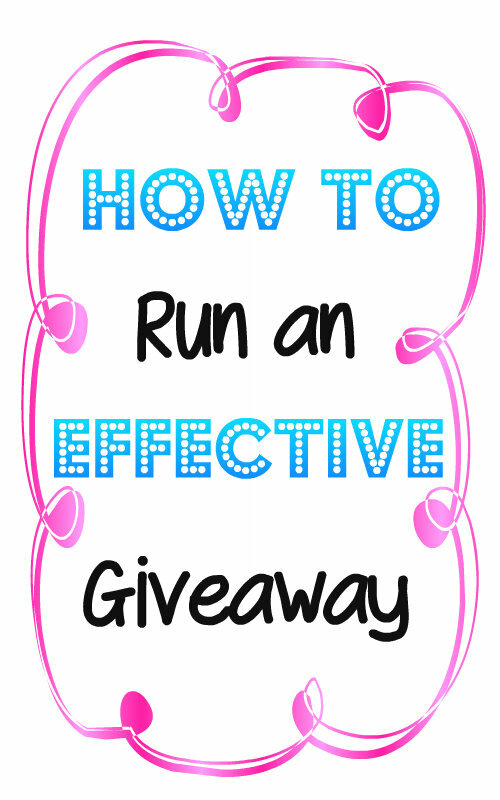 Sounds simple enough, host a giveaway on your blog. But did you know there are a lot more what, when and why... to consider before you decide to host a giveaway? Let's start with the why. Why would you want to host a giveaway? Yes, they can be fun, it's always great to feel like your giving someone the opportunity to win something. But there are several more reason's to consider hosting a giveaway on your blog. You've probably seen advertisers do it, companies will host giveaways either through ad campaigns or on their websites directly. Do you know why they do it? It's not out of the kindness of their hearts or for the tiny tax break they get for giving away a free item or two. They do it, because it drives traffic to their site and helps build their brand. So why not drive traffic to your blog through a giveaway? Giveaway participants come in a couple of ways for bloggers. You have both old and new returning viewers to your blog. You also will likely have a huge amount of first timers, who may only come to visit that one time. However, if done correctly, and if you have a great looking or interesting blog. You may just grab some of those first time giveaway viewers as long term followers. Of course to do this, you have to run an Effective Blog Giveaway. You can't just throw something together on a whim, and assume because you're giving something away, others will come. Truth is, they won't come because few will know about it, unless you planned it out in advance. I'd like to share with you some of my own tips as well as others I have learned as I have hosted giveaways. What should you giveaway? This is not really something that anyone can say, do this and it will work best. Generally if you're giving something away, you are going to want to make sure it falls within your blogs theme. If you are a sports blogger, but you are giving away a diaper bag. Not only did you just ignore your current audience. But all those first time visitors to your blog, you just confused them on what your blog is really about. Even though a gift card is always a great option, because it allows someone the opportunity to buy what they want. It's not always the best choice. As you work with companies and brands, start working out some awesome deals on things you yourself would want. It's a known fact, the bigger the brand, the more people are going to be interested! If you've visited other bloggers giveaways, have you ever stopped at one and thought the item wasn't worth the time to enter? Just because something might be free to win, doesn't mean it's worth winning! Keep these things in mind as you decide what you want to giveaway. Run a giveaway when it is appropriate. The day before a holiday, or just before a weekend are generally not the most effective times to launch a giveaway. This is when you should look at your analytics, see which days you have the most traffic. Look at the times of the month where your traffic is highest. Use that information to gear your dates for your giveaways. Also, consider the length. Generally 2 weeks is pretty standard for a giveaway. I personally don't care much for giveaways that go on for a month or several months, I will have forgotten about it. Plan yours for the right length. You don't want to run it too short or too long. Be creative with your prize. Be creative with your giveaway post. Be creative with how you want people to enter. This is your time to use your giveaway to build your blog. If all you want is a short time of page views, then go ahead and just ask them to leave a comment to enter. But if you're looking for long term followers, use the opportunity to build your social media following, get your blog out there, get it in front of other eyeballs. Think about your purpose and goals for your giveaway. Do you want to increase your traffic, do you want to build your followers? Decide what your purpose for the giveaway is, and start planning from there. If you're lucky you can get companies to sponsor your giveaways. If you have the stats and the page views and a decent following base. This can actually be easier than you think. Send out your media kit, pitch your idea to them and see who wants to use your blog to advertise with, in the form of a giveaway. Don't have a big blog, or enough of a following. Then you're probably going to have to shell out a little cash to do this on your own. Consider it an investment. Sometimes you really do have to spend a little money to make money. The same rings true with giveaways. Depending on your purpose and goals, and if you do it right. You'll likely find it is worth the investment. If you keep it simple to enter, then people will enter. If you make someone do a dozen things to get 1 entry, chances are you're not going to get many entrants. Especially if you are giving away a small lower budget item. Not everyone has a specific form of social media to follow, so keep that in mind and give your entrants a couple of different options to enter so you can make it work for the masses. Not only keep it simple for your entrants, but make sure it's simple for you to capture your entrants info. Which is why using third party systems like Rafflecopter can really help you out. You're giveaway is getting ready to launch, let others know. Your giveaway launched, get the word out. If you're not promoting your giveaway each and every day in all the ways you know, you're not running an effective giveaway. If you blog frequently, you should PIN an image with a click through on your blog's side bar, near the top for the remainder of your giveaway. So that others as they stop by your blog, they can visit your giveaway and know it's going on. If you aren't doing your part to get the word out, how can you expect a successful giveaway? I personally like to set goals for each giveaway. Before it runs, I look at my past giveaway stats and I determine my new goals for the new giveaway. Then I make sure my plan is going to get me there. Sure it's fun in itself to host a giveaway. But why not use it as a time to challenge yourself, set some fun goals to work towards. If you get to have the fun with a side purpose, you're going to find you enjoy your own giveaways even more! Maybe you have a good blogger friend, that you want to team up with? Or possibly you just have good friends who will help you promote your own giveaway. If you do, why not use them! Let them know you'll do the same thing for them when they need it! Giveaway Hops, if you don't know already I host health and fitness giveaway hops. Four of them this year, one going on right now (HERE). If you don't have the traffic on your own to host an effective giveaway. Then I highly recommend you join a giveaway hop (there are all kinds out there, you can always find ones to join that fit your blogs theme.). In hops, all the bloggers participating each bring their own followers into the mix, there is a high potential to get a larger increase in traffic by participating in these. Not to mention, it's a great opportunity to meet and follow other bloggers who are in your niche, build relationships and long term following bases. * I have to say, I have met MANY awesome blogger friends through link ups and giveaway hops, they really are effective for this! Want to join one of mine? Visit HERE to see what is coming up and sign up to be alerted when sign up's begin. I do this often, it depends on the giveaway of course. But submitting your giveaway on large giveaway communities or forums, is going to bring you lots more eyeballs and increase the effectiveness of your giveaway. Most are free, however some do charge a small fee if you want your listing promoted or enhanced. This is actually something that I am going to be trying for the first time soon. There are a few ways you can do this. If you have a giveaway that allows for entrants to enter daily, why not email all of them once mid giveaway and remind them to come back for more entries. Or after the giveaway, why not email all the entrants and remind them to come back to your blog to check to see if they are the winner... Thank them for entering your giveaway. You definitely don't want to harass them, but this is your giveaway. Reaching out to them a few times is completely fine. (Include it in the fine print (disclaimer) that this may happen.) Not only that, but a great way to keep the page views up. NOTE: You can only do this if you included a disclaimer in your giveaway. After your giveaway, download all of your new emails into a master giveaway email list. Use this list wisely and make sure you use a system that they can unsubscribe from at a later date. But if you periodically host giveaways, you can send out a mass email each time letting all of those in your list know. Keep track of the numbers and stats from your giveaway. You can use this later on when you contact brands, and ask them to sponsor you for others. If you're a blogger who is interested in building your blog. You need to create a brand for yourself, and all the different ways you can help advertisers reach new audiences. These giveaways are great ways to not only build your following base, but also build you up in the eyes of potential advertisers for your site. It's a lot of info this I know. But running a successful and effective giveaway is more important to most than to just do it for fun. Which is why I wanted to tackle this subject today. Have you hosted a giveaway on your blog before? Let me ask you, what tips to you have, or do you use to help your giveaways succeed? It's actually kind of fun to use the analytics to compare and visualize the success of it, you'll have to give it a try sometime and see. Thanks for the tips. I usually don't analyze my giveaway stats. I'll be saving this page for later so I can take a look at those links you've mentioned. It's actually one of the best things I have found I enjoy doing with giveaways, it really gives you an insight to how it all worked out. All great tips. I haven't done a giveaway in several months, but I was just offered an ambassador opportunity (I can't wait to make the formal announcement on my blog in a couple of weeks! ), and as an ambassador this should give me the opportunity to host some giveaways on behalf of the company in the future. I am excited to hear about your new Ambassador opportunity! That is very exciting!!! You've probably got a lot of blogger buddies, but if you ever need someone to co-host another hop, just let me know. I am interested. I also signed up for the July reminder. I wish I had done that for June! I am going to reach out to you for my September hop, if your interested I'd love to have you co-host with me!!! I think we all get busy! I try my best to promote daily, but ya life gets in the way. But it is exciting to see the difference daily promotion makes! We have hosted several giveaways and we seem to get lots of traffic. However, I am really only interested in giving away things we really enjoy. We have not done a giveaway hop that I recall, but that is a great way to get more traffic. I too like to either giveaway something I love, or a gift card. I can't see giving away something I am not excited to use myself:) So I am the same way! Great tips as it's always great to learn more! I've hosted a few giveaways and they do drive a lot more traffic. Thanks! They do drive a lot more traffic and can bring good traffic even after as well. Excellent tips, Kristy! I was especially interested to read about the length of time to host a giveaway. I usually do one week but it sounds like two weeks might be a better choice. I'll have to give that a try the next time I host a giveaway. I have found it depends on the giveaway. But over the years I have done quite a few of them, and I have participated and chatted with some bigger blogs and 2 weeks seems to be the majority of what a lot of people find to be the successful number. This is a great post Kristy! Thank you! Thanks for the sites to promote the giveaways! I hadn't heard of any of them! Never thought to analyze my stats on my giveaway posts! Will definitely do that from now on! They are actually great sights to use, I actually use them frequently and it makes a dramatic difference even when I just use the free services. These are all great tips! I usually do one week when I run giveaways, but it seems like I might need to switch it up and do two weeks going forwards. I also never really thought to look at my traffic to see when would be the best day to launch a giveaway, even though it makes complete sense. Thanks for sharing! It's actually one that may be different for everyone. But use your analytics and compare and use that to gage which is the best time frame for your audience and giveaway type.